Cob Jockey: Business in the Front, Party in the Back! 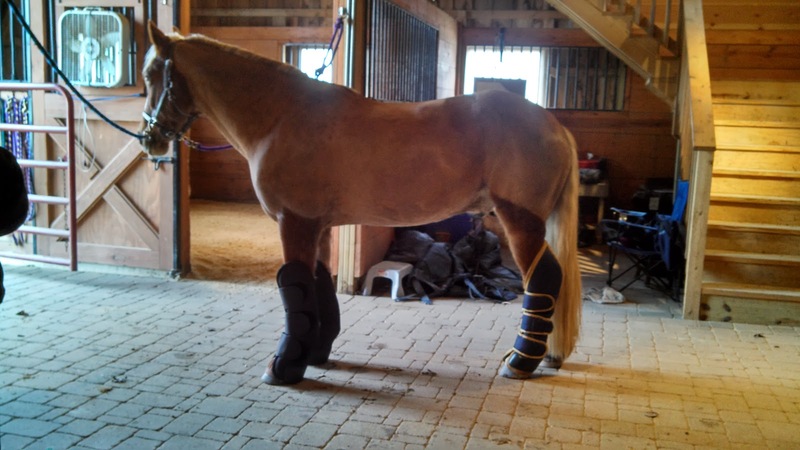 I'm not a fan of shipping boots due to heat buildup and other reasons - I'd ship in just in bell boots to protect the coronet band if I could - but they're a necessity when you're always the middle guy in the back of a six horse head-to-head with sundry horses around you each trip. And like other things when you're in a program (it feels weird to say that, the program has sort of taken shape around me), "when in Rome." I know he looks ridiculous, but that $114.99 retail price is an entry fee, or a clinic. If I can find a way to protect him for a third of that, well, he's just going to look ridiculous. And bonus: I get to giggle every time I see him wearing them! That's awesome! It's sticking, they will forever be the mullet boots. For trailering, they're below shipping boots in my book. Heat buildup and safety issues: one torn wrap or failed piece of Velcro and you have a tangle situation. At least boots are just one piece if they come off. Not saying I've never used wraps, but I don't like them in trailers. Shipping boots have their own set of problems, but they're the best option until I have my own trailer. You really can't. No reason to buy anything full price if you're patient! Yeah that is totally sticking. Maybe the humor will make my trainer okay with it! Love the title!! Haha! And really can't beat the price! That is a killer price! Mix and Match boots are the new thing for all the cool kids. Keep telling Connor that, anyway. Aw man! Well, I wouldn't have wanted to cheat you out of money anyway, I bet yours are worth more than $30. I got a good story, anyway. I need to get better about shopping for deals. Thanks! I'm really good about deals, I'll make anything old work until a killer deal comes along. Patience! Excellent way to go about it! I snagged a full set of brand new dover shipping boots for $50 shipped. And since then, I haven't shipped anywhere. Yay for still being brand new? Hey, it's not like a computer that becomes obsolete by sitting around. There's a lot to be said for unused shipping boots! $50 is pretty dang good too, especially for the Dover ones. Gotta say, Dover's won me over with these mesh ones. Because it goes past his knees? Haha! Perhaps you will set a new trend, similar to the girls miss-matched socks. At the last VA Welsh show with Nicole and Peggy, Roscoe and Comrade were trailered together. Somehow Roscoe came untied (Comrade could have untied him, who knows!) and Roscoe proceeded to remove Comrade's shipping boots! I'm sure he had a great time with all of that velcro. Silly Welshies! Oh you are so right! Just try keeping a Welsh in anything, fly mask, blanket, whatever. Connor is in the process of destroying his winter blanket as we speak. :-( He's learned how much fun rubbing up against the one row of metal fencing is on the property. I think they should be sold in sets of front and hind separately, can you imagine how many orphaned sets of front shipping boots are out there after the hinds got destroyed in the trailer? You never hear about the fronts coming off. aww he looks cute! I have the rambos and amigos...they are decent but about double that price.